In a meadow, not far from the cemetery of Pyatigorsk, a town lost in the mountain range of the Caucasus, drenched by torrential rain, a man sits in the grass. Cradling the head of a dying man in his lap, deadly wounded by a fatal shot in the duel that just ended, Mikhail Glebov, the second of the duelist, is trying to pull his grey coat over the frozen face. The blood oozing out of the wound, caused by the bullet that perforated the heart and lungs, mingles with the rain and taints the grass. The thunder booms between the mountains. In the dark, the tethered horses neigh, rear, and paw the ground with their hooves. The lightning illuminating the scene is incessant and “frightening beyond words”. Mikhail Lermontov, the writer of “A Hero of our Time”, second in his talent only to the great Pushkin, has just been killed at the age of twenty six. “Lermontov, Tragedy in the Caucasus” written by Laurence Kelly is not only a very detailed and well researched biography, it is also well worth reading just for the sake of the story and the figure of Lermontov. More so, Kelly’s fluent prose drags you into the story and keeps you on your toes till the fatal end. At times you have the impression that Kelly regrets he is writing a scholarly piece of work for in his enthusiasm with his subject his writing at times flirts with the lyrical in his descriptions of the Caucasian and Russian nature and people. The short live of Mikhail Lermontov is full of events. He is raised by his rich grandmother on their estate not far from St Petersburg, after the early dead of his young, frail, delicate but consumptive mother (“An incarnation of Pushkin’s Tatiana” they say). His father, Captain Yuri Lermontov, keeps himself busy with the traditional distractions of serf girls and drink. The rich grandmother has family in the Caucasus and together with her grandson, her servants and a militia they will travel three times, over several years, to visit them. These voyages at a young impressive age mark young Mikhail for the rest of his live. He began to learn about this new, wild , Eastern world, so different from the monotony and ageless routine of central Russia. Who where all these different tribes? He noted the shaven heads, small sparkling eyes, projecting cheek-bones and yellow-ness of the Nogay Tartars, whose ancestors had followed the Golden Horde. He discovered that the Ossetins had blue eyes and red hair. He admired the svelte and the noble figures of Kabardins, and their handsome aquiline noses. But it was the visit of the occasional Chechens, Ingushi, Avars and Lesghi that caught his attentions. Swarthier and stockier than their western cousins, these tribesmen of the eastern Caucasus had eyes that flashed with an unrivalled “cunning and sanguinary spirit” and their jackal-like war cry, or dying chant to Allah, reminded all Russians that in the black, rocky fastnesses of Daghestan they faced tribes reared on the name of the Prophet, knowledgeable of their Koran and reminded of it by the line of warrior Sheikhs and Imans, Mansur, Kazi Mullah and Shamyl. It is this delicious rendering of an exotic vanished world of the Caucasus which is one of the prime attractions of this biography. Educated at the military school, Lermontov soon turns into “l’enfant terrible” of St Petersburg social life. Again Kelly masterly conjures up the St Petersburg world of the endless balls, the flirting between the young cadets and the lovely debutantes, the drinking bouts (mostly Champagne, Veuve Cliquot and Moet), the gambling nights, the horse breeding and racing. Life for the high society in Russia in the middle of the 19th century is an endless feast. It is the death of the great Pushkin, victim of a duel, which halts this merry carousel for a moment. 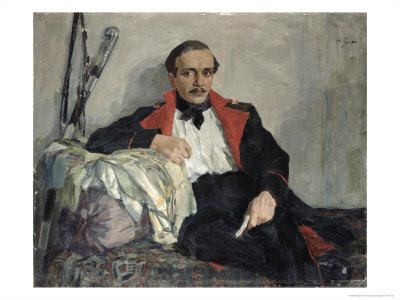 Lermontov, by then an aspiring writer and poet, reacts with his famous poem “Death of a Poet”. The Czar gets a copy and is not amused. To calm down this young lion, Lermontov is send to Nijegorodtsy, on a first “Tour of duty” (two more will follow ) with the Dragoon regiment based in the Caucasus. Apart from the occasional skirmishes and sometimes real battles with the locals, the officer’s life is a picnic variant of the life in Saint Petersburg. Appraising the beautiful girls walking on the boulevards of the spa-towns, bals, flirts, hunting, gambling, Lermontov knows the drill and is not so much “dépaysé” as one might expect. In restless Lermontov, a Byronique spleen, installs itself. It is this Romantic boredom which slowly turns into his negativism and his awareness that he is part of a lost generation. Lermontov as a writer is one of the first to try his hand at psychological development of his characters. His book “ A hero…” is an important work of transition between between the neoclassical and Romantic literature. Lermontov’s writings are more and more appreciated by his public and his works have increasing success as they are published. The novel “A hero of our time” of course and his many splendid poems. But when he is not writing, Lermontov does not act as is expected from him. It is with a self-destructing logic that his attitude will increasingly irritate the powerful people (including the czar) who have been keeping a close eye on this wild element of the Aristocracy. The Decembrist failed putsch is still fresh in most people's mind. Another duel to which he is challenged is the proverbial drop and Lermontov is send once more to the Caucasus. Kelly masterly explains the court machinations of the Czar who has set up a trap for Lermontov to get rid of him definitively. Back in the Caucasus, Lermontov neglects the orders to report to his squadron. Under the excuse of being ill, he makes a detour to Pyatigorsk, a spa town with an interesting night life. Dancing wild mazurka’s, with the local beauties in an endless string of balls, enjoying himself with his companions in never ending games of faro, day – long hunting parties and writing, Lermontov’s live slowly whirls towards the moment when he, with a trifle, insults a fellow officer Martynov and is challenged to a duel. Kelly suggests that the organization of the duel was so un-serious that it looked like the contestants would never have shot at each other, finding a way to give satisfaction without bloodshed. There was no doctor present for instance; there was also no cart to bring the wounded man back to town. Both Lermontov and Martynov, were very relaxed about it all, Lermontov even confirming to his seconds that he was not going to shoot. But Lermontov at the most critical moment, standing 20 feet from the muzzle of a loaded gun, quips “I shall not fire on that fool”. This remark so infuriates Martynov that in his angry frustration he shoots his pistol and kills Lermontov. Slain, as he was, alas! So pitilessly!